However Eurozone economic surprises are conversely in a downtrend, and the relationship shown below suggests this disparity is the dominant factor in the declining Euro v USD FX. The collective trend was up from November to the end of January. Since then it would appear that we have been in consolidation/correction mode – and this is a fit with the 5-models-in-alignment (see my Tools For 2013 post). Currently, cheap and unloved assets are Euro, coffee, sugar and gold miners, whilst those reaching into overbought and overbullish zones include the US Dollar, Dow Transports and SP500. If we look at the bullish percent over call/put ratio for the SP500 we can see that we have been recently oscillating in the frothy zone which led to a swing top twice in 2012. However, 2010 and 2011 show things could potentially get frothier, with spikes up to 150. Crude has accelerated this last week with good momentum, but now encounters resistance. It does not have fundamental support from stockpiles, as they continue to be above seasonal average, but I suggest it is the global growth story that is the main reason for the advance. Meanwhile, coffee, sugar and some other agricultural commodities are at secular bull rising support, which also puts them at a key decision point – either a break down or the start of a new upleg. 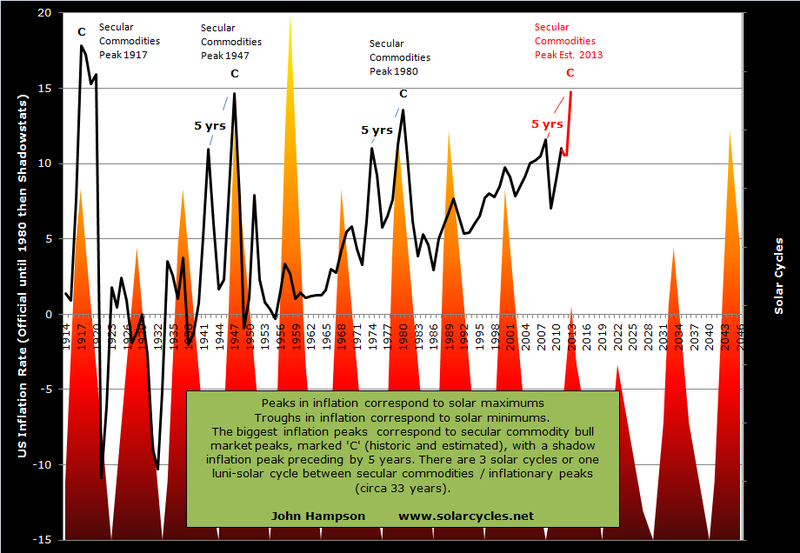 I still believe the greatest likelihood is of commodities taking off and becoming the outperforming class going forward (based on sunspots, secular history, late cyclicals), and I am positioned accordingly. However, I continue to wait for specific supporting evidence to confirm this, namely a new high in sunspots, a technical break out in the CCI, and for any pullback in stocks to be counter-accompanied by an advance in commodities. A lower low and a lower high means the geomagnetic trend can no longer be classed as up. In addition, there is some frothiness in stocks as identified above. Therefore, as per the make up of my highest probability trading analysis, I am not going to take this one. I am now back in England. So, broadly speaking, long equities is the trade. This is backed up by stats showing that stocks are in a bull market 80% of the time. Bull cycles in stocks have an average duration of 5.4 years and an average gain of 74%. Bear cycles average a duration of 1.5 years with an average loss of -12.7%. If we also include the fact that secular stocks bulls go upwards whilst secular stocks bears go sideways – rather than down – then a naturally bearish bias is an impediment in playing the markets. I also suggest the trade is to be long a stock index rather than an individual stock. Roughly speaking, 50% of a stock’s movement is attributable to the overall stock index, 30% to its sector, and just 20% its own. Individual stocks can go bust, or plummet on surprise bad news. I believe that the shorter the trading timescale, the more randomness and noise there is. Many people (and machines) buy and sell specific assets at many different times for many different reasons. The longer the trading timescale, the clearer the trends. However, trades left on for years will be profit-diluted by counter cycles within an overall trend. So, if we can identify when cyclical stocks bulls begin and end, we could go long the stock index for the duration, or we might look just to capture the significant upwards swings within that. How can we identify the beginnings and ends of cyclical stocks bulls? Well, there are no hard and fast rules and it is not easy, but history, as always, is our guide. Cyclical stocks bulls normally end with yields rising, inflation rising, and tightening that chokes off growth. They end with a topping process, a price range lasting several months, with divergences in breadth and leading indicators. They end with overly-bullish sentiment and valuations. In contrast, cyclical stocks bulls begin with overly-bearish sentiment, a capitulation in breadth, positive divergence in leading indicators, and often a V-bounce price bottom. We can also draw on solar-secular history to gauge likely timings of starts and ends. So, we might refine the highest probability trade and suggest the trade is long the stock index during cyclical stocks bulls whilst the cumulative geomagnetic trend is upward. We can identify a likely change in geomagnetic trend using the 3 week geomagnetism forecast and the typical seasonality of geomagnetism, both of which I model. Within that, there is lunar phase oscillation. 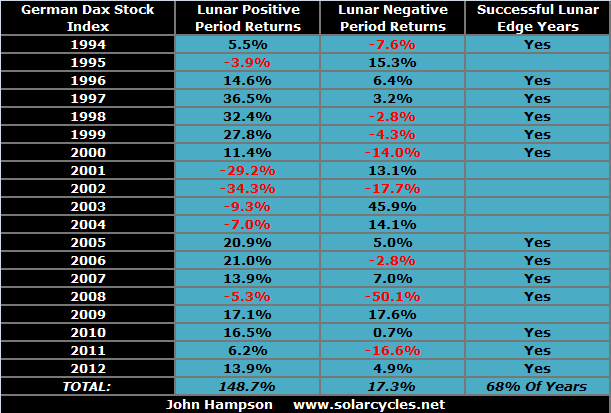 The period into and around full moons is largely one of poorer returns than the period into and around new moons. So, we might go long the stock index at the start of each positive lunar period and close at the end of the positive lunar period, during cyclical stocks bulls whilst the cumulative geomagnetic trend is upward. These trades would last around 2 weeks each. So which stock index might we use? 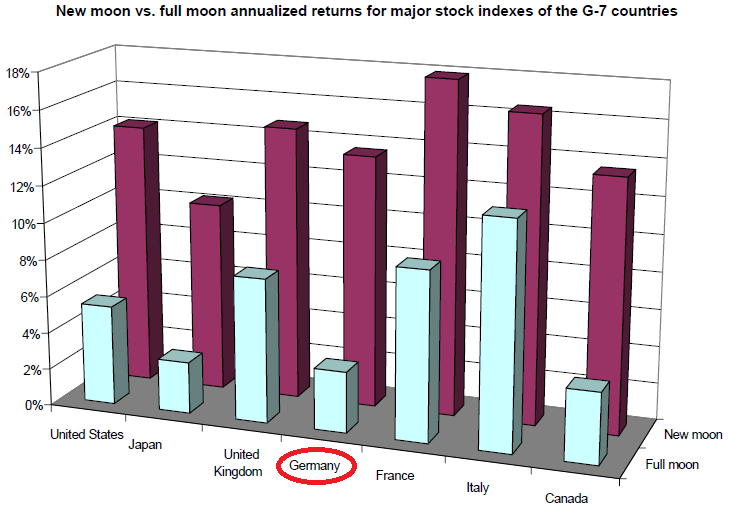 Dichev and Janes showed that all the major stock indices around the world show better returns around new moons than full moons, but two of those showing the biggest differentials were the German Dax and the Singapore Straits Times. 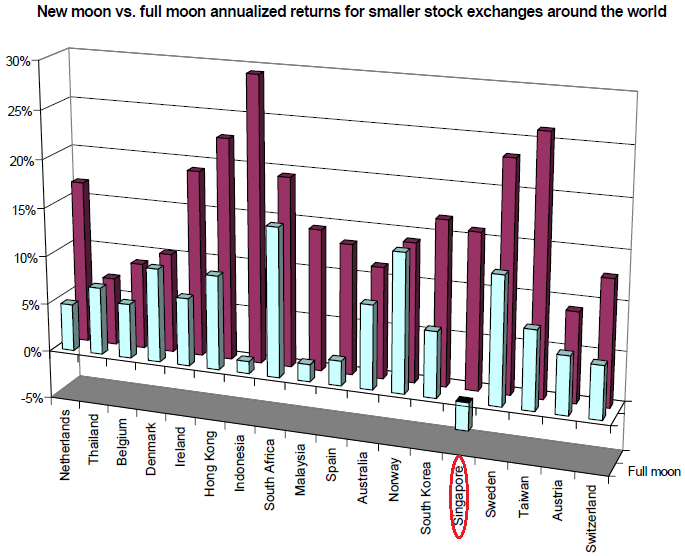 Whether this is something cultural that produces greater sensitivity to lunar phasing, or whether this is because more traders use moon-phasing in these countries, would perhaps be another paper in itself. But the German Dax and Singapore Straits might offer the best returns if we are to trade the positive lunar fortnights only. What about geomagnetism sensitivity? Krivelyova and Robotti revealed that most major country stock indices perform worse following geomagnetic disturbances. However, Germany and South Africa were the exceptions. My cumulative geomagnetism chart above calls into question their assessment of Dax non-sensitivity (I suggest this is because of method – they only looked at performance up to 6 days following a geomagnetic storm rather than using a cumulative trend in geomagnetism). Nonetheless, by their research, the stock indices with the biggest differentials for geomagnetism were the US indices. I suggest, then, that we might trade the German Dax, the Singapore Straits Times and the US SP500, and this has the benefit of diversification, with stakes in America, Europe and Asia. Lastly, rather than mechanically trading this idea, I would like to look at each such opportunity and assess whether the stock indices are overbought or overbullish, and how they stand technically (at support or resistance or in bullish or bearish patterns). I would be keener to take the trade if stock indices are not overly frothy, not bumping up against key resistance or carving out potentially bearish formations. So let me sum up. My suggestion for trading of the highest probability is to go long (i.e. buy) the German Dax, the Singapore Straits and the US SP500 (for diversification and natural sensitivity) at the start of each positive lunar period and close (sell) both at the end of the positive lunar period (roughly a fortnight), during geomagnetic uptrends within cyclical stocks bull markets, repeating these trades each lunar month where the stock indices are not overly bullish or overbought or suffering bearish technicals. What’s your take on this, and what would you consider trades of highest probability? In the next post I will delve deeper into this idea, and offer supporting statistical evidence. 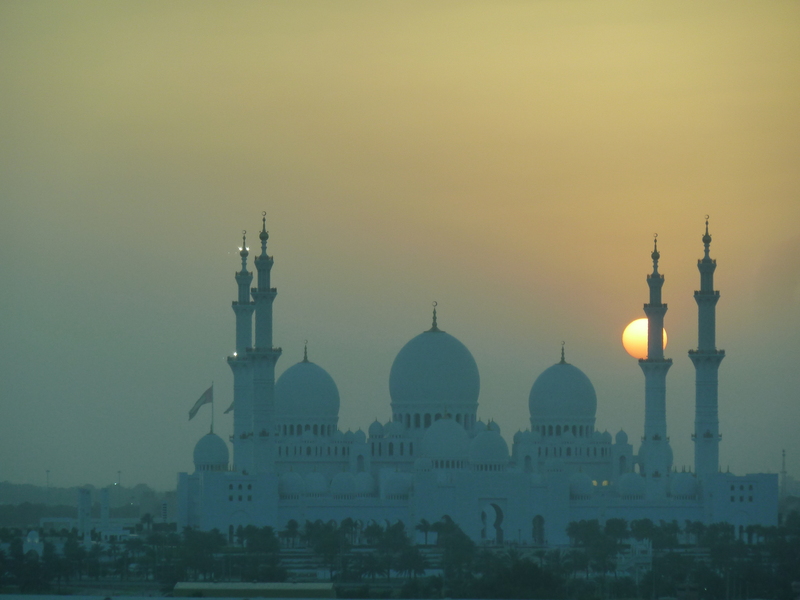 The last stop on our 5-month trip was Abu Dhabi, and in 2011 I also spent a week in Dubai. 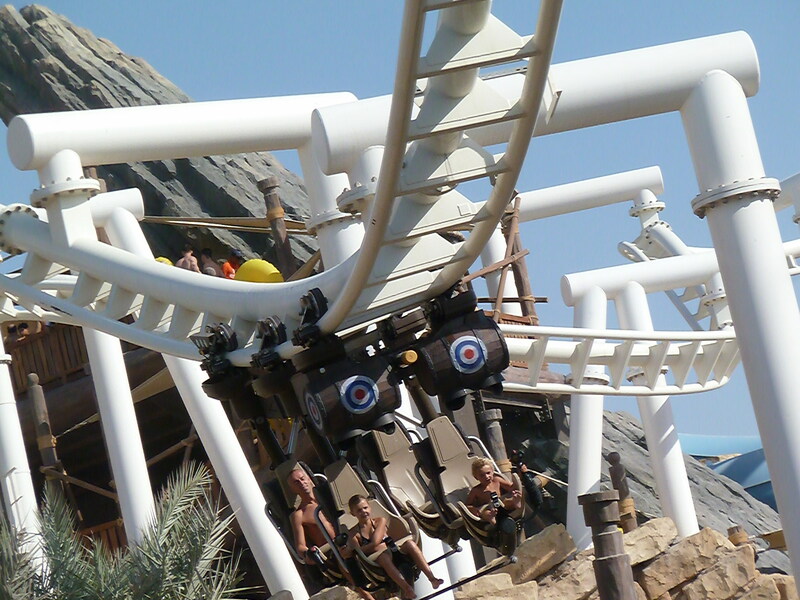 Of the seven emirates, these are the two where the action is. If you have money, ambition and imagination, Abu Dhabi and Dubai are examples of what can be achieved. They are works in progress, young models of new cities and more time is required to both complete the projects and judge the success. But whatever the future holds, this is an exciting part of the world right now. A potted history. Around 50 years ago oil was discovered here. Prior to that this region largely comprised desert villages, coastal souks and a pearl industry. The British were involved (again), having some say in the rule and protection up until around 1970. Finding oil brought about and funded the first wave of development. Then around 15 years ago, Dubai, faced with oil reserves that were due to run out around now, embarked on an ambitious diversification strategy, to bring business and tourism in to replace the oil industry. Abu Dhabi followed with its own similar programme of diversification, though not as urgent as oil reserves are still plentiful. 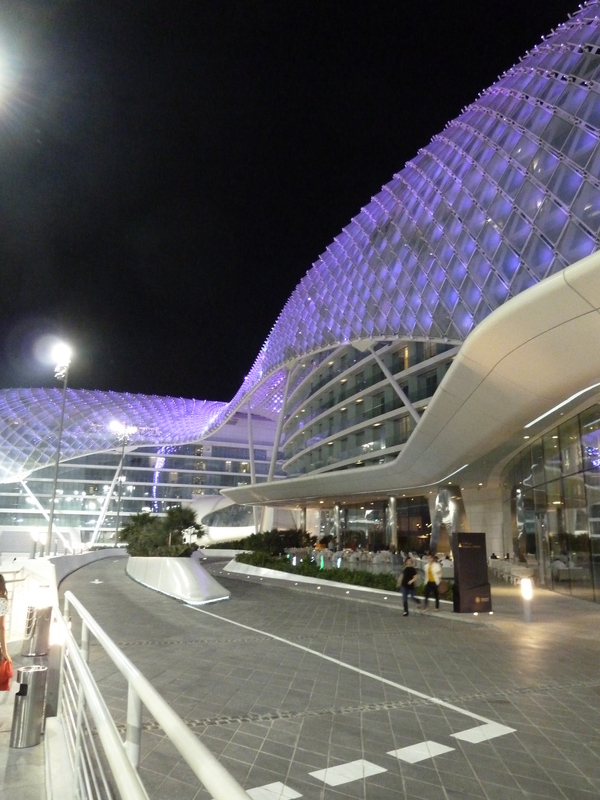 It is the scale and imagination of the programmes that impress: from the world’s tallest tower (Burj Khalifa) to the world’s only (unofficial) 7 star hotel (Burj Al Arab), from a self-contained zero carbon zero waste city (Masdar) to a man-made set of linked islands in the shape of a palm (Palm Jumeirah). The breakneck development of the two Emirates de-railed during the financial crisis (as the funding flows came to an abrupt halt), but is now back on track. This is a desert country, but coastal, so water is procured through desalinisation. It barely rains at all here, which means everything can stay outside, such as fabric sofas on the beach. Temperatures can rise to 50 degrees in the summer, so air conditioning everywhere is the norm. Fuel is subsidised and ultra cheap, whilst other things, such as tourist attractions, are expensive. You can earn a lot of money here as there is no income tax, but you can also earn very little too: many manual or service workers who come here from places such as Afghanistan and India live 4 to 7 men to a room and work long hours for very low pay. It is nonetheless more than they would make back home, so they keep coming. 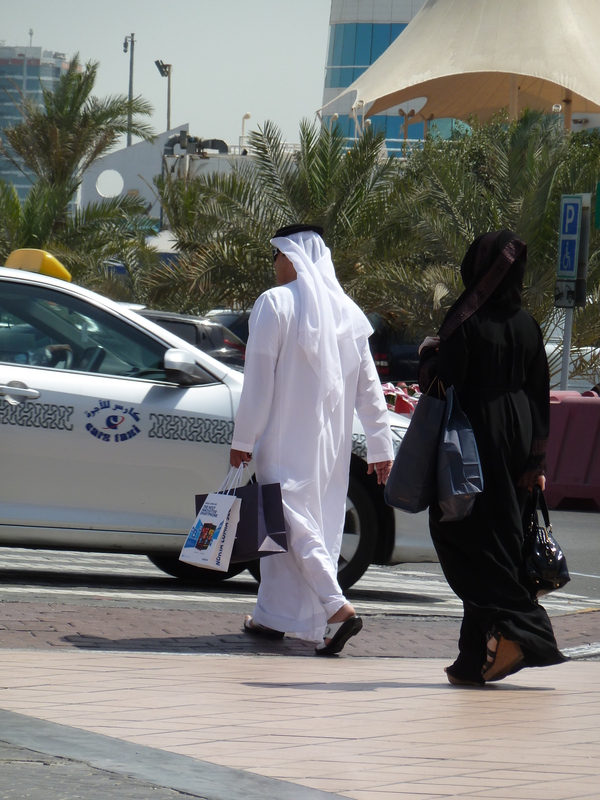 Immigrants now make up 90% of the people here, and the now-minority Arabs differentiate themselves by wearing the traditional robes. You are unlikely to come into contact with the Arabs in service roles (they are largely a rich upper class here) but they dictate the culture here which is then embodied by the immigrant workers. 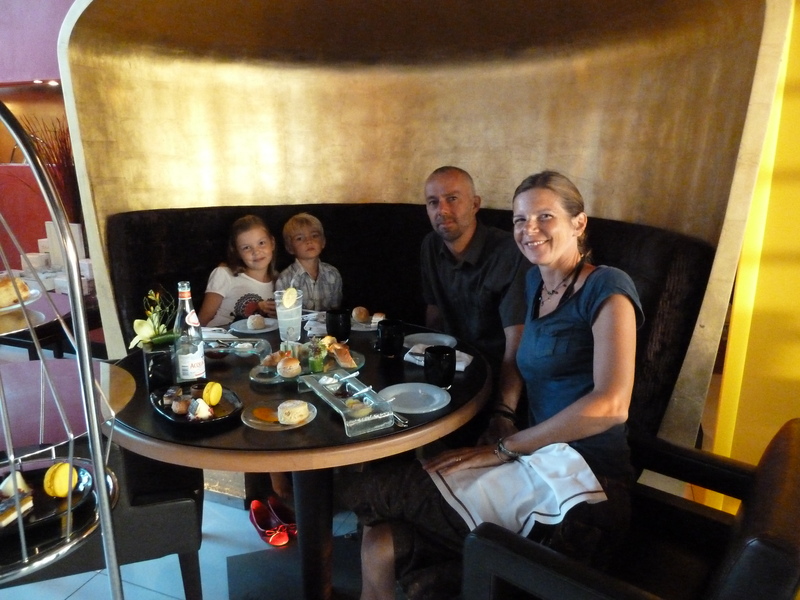 It is a culture of respect, high standards and service, and you, as a visitor, are treated like a king. But you need to be aware of and conform to the rules. This is a society where the culture and the religion are one and inseparable and Islam is written into the laws. Concessions are made to immigrants and tourists: alcohol is made available in some hotels and some supermarkets. But no being drunk in public, no kissing on the lips in public, no raising your middle finger in public, no thong bikinis – as a visitor you need to be aware of these laws. If you choose to live here, then no getting into debt, no homosexuality, no criticism of the religion, no (other) drugs. Expect harsh punishment if you are caught flaunting any of these. If some of these rules seem unpalatable, I’d nonetheless suggest to go visit at least once and experience the intriguing experiments that are Dubai and Abu Dhabi, then make up your own mind. I covered commodities in detail here, showing that we might expect commodities as a class (i.e. we should not need to be picky about which commodities – there should be broad participation) to rise into and around the solar peak, with a bias towards peaking after the solar peak, which could therefore be Q4 2013 or Q1 2014 even. We should see growth and inflation together, but with the emphasis on inflation, until commodity prices rise too far and help tip the world into recession. If we draw together stock market history and exclude solar theory, using Russell Napier’s work, then the current cyclical stocks bull should end with rising treasury yields (6% the historic tipping point marker) and rising inflation (to 4% as a historical marker, using the official inflation rate). In other words, it is the same target: growthflation until excessive inflation and tightening. This is an important lesson, because many have prematurely called the end to this cyclical stocks bull when conditions have appeared to be worsening. We should be looking the other way: we need conditions to become growthflationary before the cyclical stocks bull can end, and since 2009 we have only seen short cycles of growth and/or inflation giving way to short cycles of weakness and deflation. The current strength in leading indicators and coincident data looks promising to stick long enough to get the required frothiness into markets and the economy. As the Fed has explicitly manipulated the treasury market, I suggest we ignore the 6% marker this time, but just look for evidence of persistent upward trending yields to demonstrate that money is exiting that class and pouring into commodities. We have seen yields rise 25% since 2012’s low (and I believe that move is the process beginning), but they could still potentially be in a downtrend, so I want to see them break out of the downward channel and above the 200MA. What do you see? 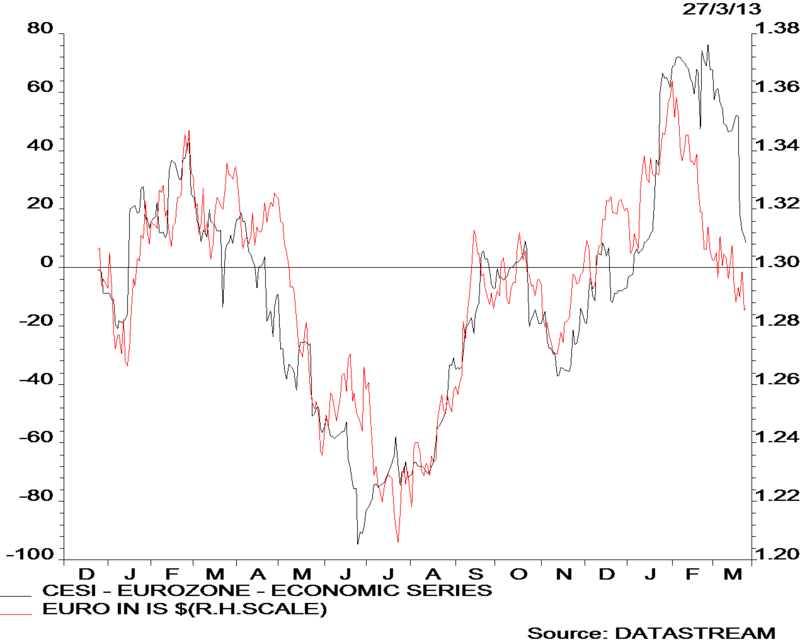 A secular commodities bull market that ended with a second peak in 2011? 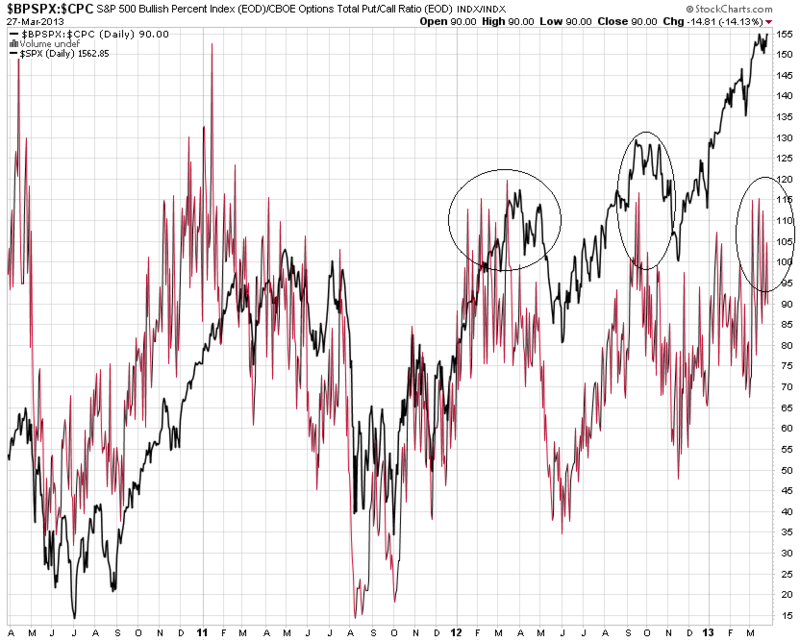 Or a secular bull market still in tact that has been consolidating since 2011? Well, we don’t have to wait long to find out the answer because of the triangle shown. Either commodities will break upwards and out, which should then inspire momentum buying, or commodities will break downwards and out, confirming a bear market in place since 2011. Based on solar-secular history, and based on the solar peak likely being ahead, I predict the former: for commodities to break out and become the outperforming class. I have highlighted the last two cyclical stock bulls topping processes and the associated lagged peaks in commodities. This should make it clearer why I exited my stock indices longs, because although I predict a marginally higher high ahead for equities, and we do not as yet see divergences in breadth or leading indicators, I suggest we are at the start of this pattern, and the upside remaining for equities is fairly limited. My forecasts for inflation, commodities and equities are all based on historic norms as I see it. That does not preclude an anomaly occurring. Therefore I continue to assess whether evidence supports my case. The current trends in coincident data, leading indicators and treasury yields are all supportive. However, the missing elements remain a decisive upward break in sunspots, momentum shifting to commodities, and ideally a run against the US dollar. Chris Puplava expects this latter development – that the fear and negativity that has been directed at Europe will shift to the US for a period. Here we see the US dollar index versus gold and the potential for that to occur: the USD retreats now from resistance whilst gold pushes upwards and out of its triangle. The opposite scenario is also possible: that the USD breaks upwards and out and gold breaks down. So one relationship to watch. Personally, I am not sure whether a run against the USD will take place. However, as long as the USD range trades and does not find grounds for a bull run upwards, that should be sufficient as a backdrop for a commodities finale (as occurred for the 1980 commodities peak). Based on this, equities may make a swing top here, or at best lose momentum looking out into April. 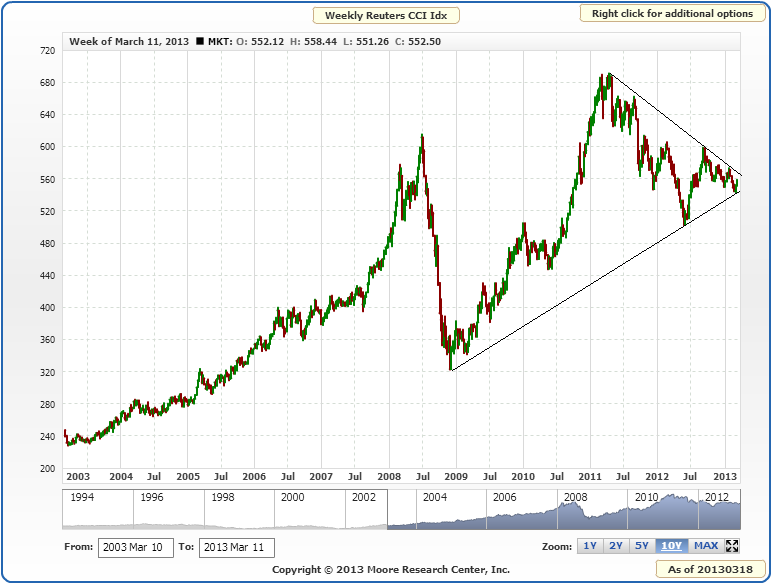 Should this occur, then commodities should begin to outperform. New Zealand was the last major landmass to be settled by humans. Just 800 years ago or so, Polynesians arrived and established the Maori culture here. British colonisation took place in the 19th century and the demographics today reveal 15% Maoris and the larger part of the remaining majority of British and Irish descent. There are similarities then in the demographic make-up with Australia, but the indigenous people here are more significant in numbers and arguably less indigenous. 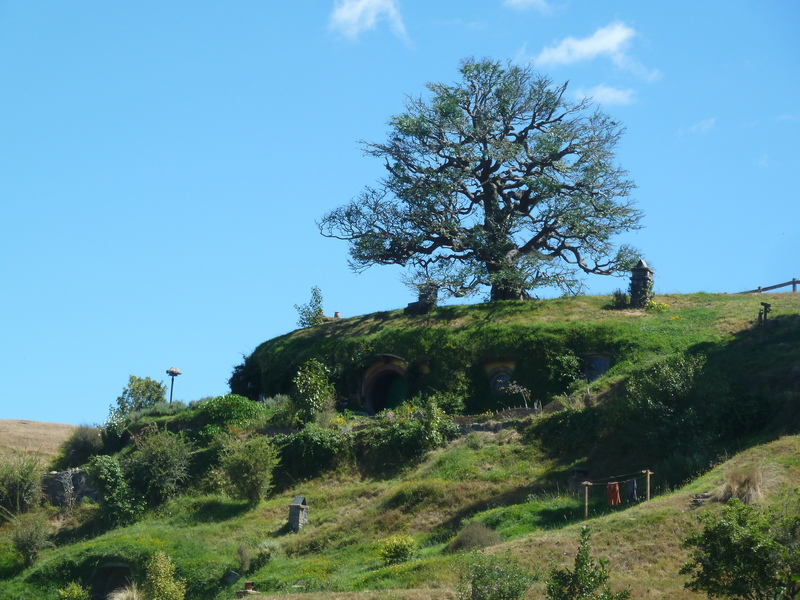 Only around 4 million people live in New Zealand and over half of those are found in the 4 major cities. That leaves a lot of wide open nature and the landscape is both beautiful and rich in natural resources. The country scores highly versus the rest of the world in various measures, including environmental health, biodiversity, self-sufficiency in foodstuffs, education and female equality at work. Despite being a world-leader in such rankings, there is a brain-drain occurring to some degree from New Zealand to Australia – however, this is being backstopped by migration to NZ from Europe and other parts of the world. Like much of the planet, New Zealand is suffering from global wierding – in the form of drought currently – and this threatens its farmed exports this year. Because of the natural resource bias to the economy, NZ has fared particularly well in the secular commodities bull since 2000. Like Australia, I think this is the wrong time to invest because the commodities boom has driven up the currency and elevated property prices to above 2007 levels. If I am correct that the secular commodities bull is shortly coming to an end, then I expect New Zealand to experience an appropriate pull back in its markets and currency. Looking further out in to the future, however, I see the country as a likely riser on the world stage, sharing Australia’s main key ingredients of being rich in natural resources, with lots of space to develop into, being a young country unimpeded by tradition, and being largely made up of ambitious, adventurous immigrants. 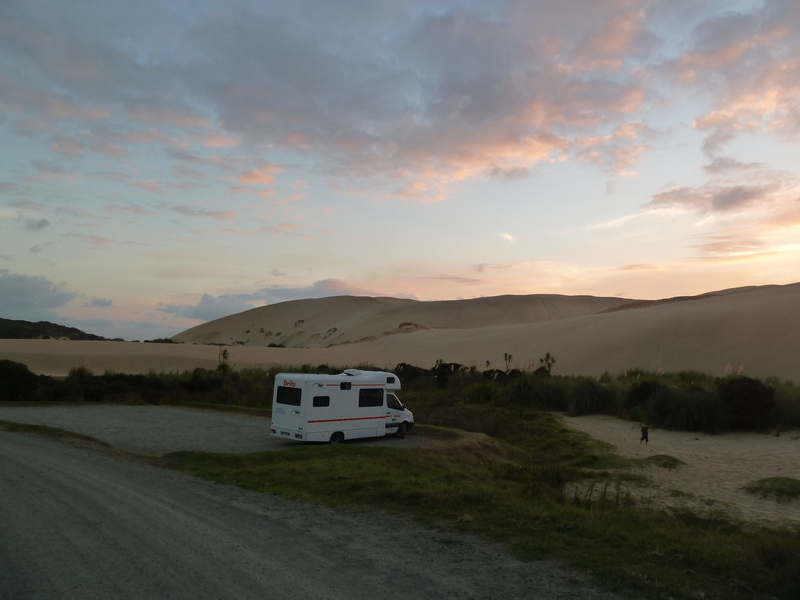 I spent 3 nights in Auckland then 12 days motorhoming around the North Island. If I can be a picky traveller, I found it lacked a few land animals with which to have encounters. It’s the kind of landscape that feels like it should have some large predators but it doesn’t and never really did have. On the flip side that makes it a safe place to do wild camping, and whilst the authorities have tightened up a little on freedom camping in recent years, it is still largely permitted, with the exception of just a few areas such as the Cormandel peninsula. I found 12 days in the motorhome too many, due to the impoverished living standard (cramped, cold in the morning, and so on). However, if you can put up with that, I suggest it is a country particularly suited to it, not least because you can share nights alone with large wilderness and amazing views, both with permission and without threat. I found the large scale modern architecture at Omaha Beach very exciting, and the coastal towns around the Bay Of Islands very picturesque. NZ is also rich in geological interest. 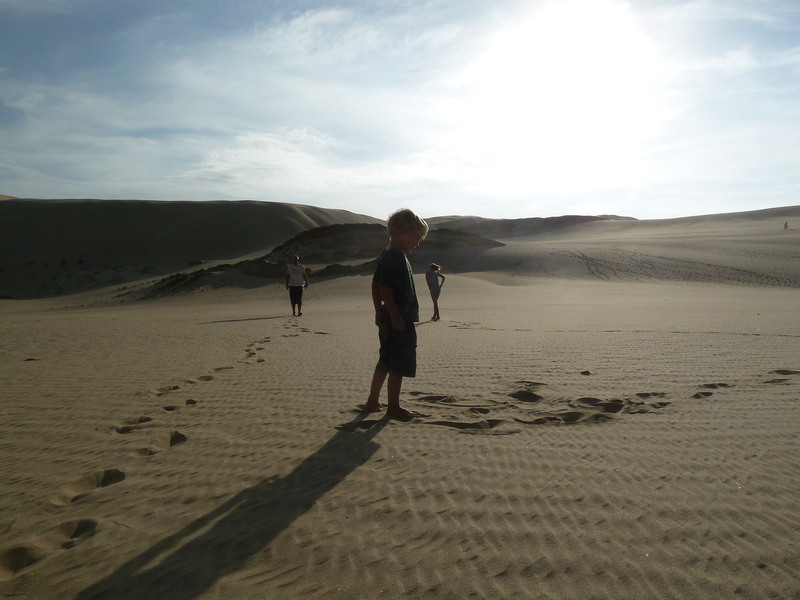 Highlights included the giant sand dunes at the top of North Island, ‘hot water beach’ on Cormandel and the geysers and mud pools at Rotorua. 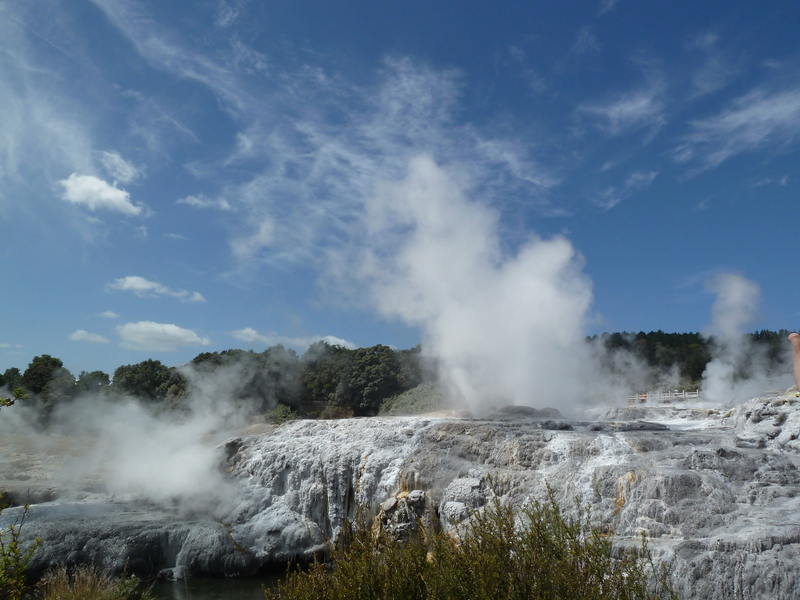 These latter phenomena reflect the fact that New Zealand is volcanic, and still active. There is a supervolcano centered around Taupo and a megavolcano building under the sea to the north of the island. Clearly, volcanic activity is a risk to NZ, and it is the kind of black swan risk that probably won’t happen for thousands of years but yet could surprise at any time – at least until volcanic prediction becomes more accurate. I have taken profits today on all remaining stock indices longs, namely Nasdaq, Austria 20, Dax, UK FTSE 100, Hang Seng, Singapore, China and Russia. Global narrow money suggests a Spring top for global growth, PFS predict a topping out of US economic surprises and through cyclicals a market top around March, and the five models in alignment may not have fulfilled their swing low yet – it could come deeper in late March, before the push up again into mid-year. The pressure swing from new to full moon switches this weekend into to the negative. And so, I have opted to cash in and step aside, leaving long commodities and short treasuries positions, with the large weighting in the former. My expectation remains that stocks should make a range topping process from here into mid-year whilst commodities take over as the outperforming class, as money exits treasuries. 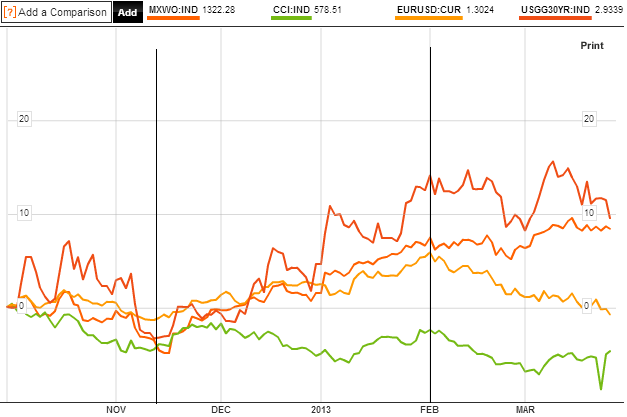 The stock indices longs have paid handsomely – now can commodities go on to deliver similarly in a final secular push? 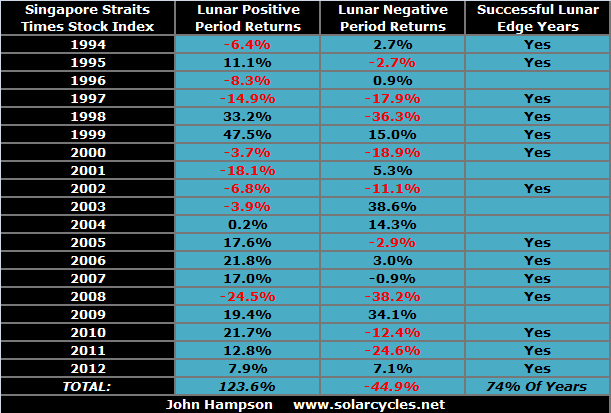 Four years of the cyclical stocks bull (in certain indices) gives me four years of the lunar geomagnetic model. If I remove the lunar phase oscillation (up and down alternate pressure between new and full moons) I can show you the chart showing purely geomagnetism. To be clear this is daily geomagnetism made into a cumulative trend line, with a 6 day lag as per Robotti/Krivelyova research, and nothing else added. The second chart show the Dax versus geomagnetism, and whilst the Dax and SP500 have on occasions peformed differently, there is the same overall close alignment of the waves, with the same inversion exception last year. The third chart shows the Reuters Jefferies commodities index, which again has gone its own way at times compared to the stock indices, but nevertheless the waves align well again, and the single exception period is the same. Levels of geomagnetic disturbance in the atmosphere has been shown to impact human mood. If changes in mood subtly affect the collective behaviour of market participants then we might expect to see some correlation between risk assets and geomagnetism. I believe the above charts are good evidence that this is the case. Yet, I know of no-one else who runs a geomagnetism model and I can count on one hand the number of analysts/sites out there that track geomagnetism to use in their trading toolkit. Maybe this is more widely followed than I imagine, but it is not promoted as it would not sell to clients – I don’t know. If the model fails badly going forward, then I will not be defending it. But looking back at the chart from the Peak v Peak page, showing geomagnetism versus the SP500 around the last secular peak, there appears to be more historical evidence that it is influential. I again have removed the lunar oscillation and show you the alignment of the waves. Once again there is a single period where the model inverts with the market, and in this case lasted around a year. So how might we use this as traders and investors? I don’t see a way to parcel this up into a repetitive trade. 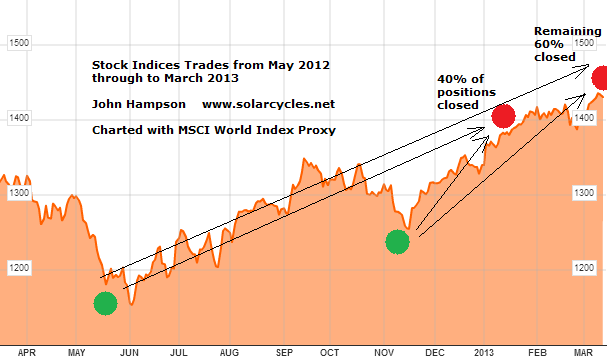 I suggested in my Trading The Sun pdf that trades would present themselves when the market moved away from the model. But there are times when they don’t come back together for some time. I therefore suggest that it is better to follow the general path of geomagnetism, and use it as a guide. Occasionally there may be a period of inversion – for reasons unknown – but largely it should be a useful guide. To this end we can use the 3 week forecast to look ahead, and the seasonal model of geomagnetism that shows us how historically geomagnetism tends to flare at certain times of the year more than others (whilst understanding that occasionally we may see unseasonal behaviour). I therefore rate geomagnetism as an important tool to use along side other market disciplines. To the markets. 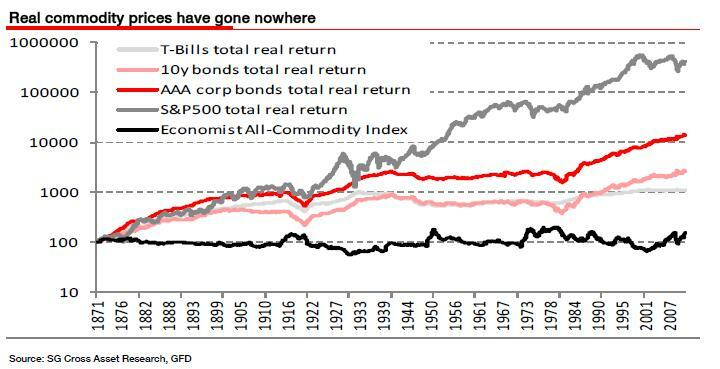 I am staying put at the moment, still expecting commodities to start to outperform stocks, and weighted accordingly. 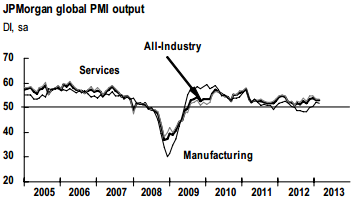 CB leading indicators for Japan and Spain came in strong. OECD leading indicators for OECD countries came in strong bar China and India. Leading indicators as a whole do not show degredation, which I would expect for a cyclical bull top. Breadth remains supportive in equities. 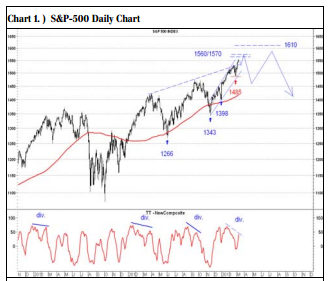 The SP500 is within a few points of the 2007 high and I expect a touch. This is roughly where Tom De Mark expects a swing top. If we can push up to there this week I may take off some equities profits. I have hope at this point that we are headed for yields rising, inflation rising and commodities making a belated push to help tip the world into a mild recession into 2014. These are all features of how previous cyclical bulls have ended, and until now (since 2009) we have not had enough sustained growth to get us to that point. 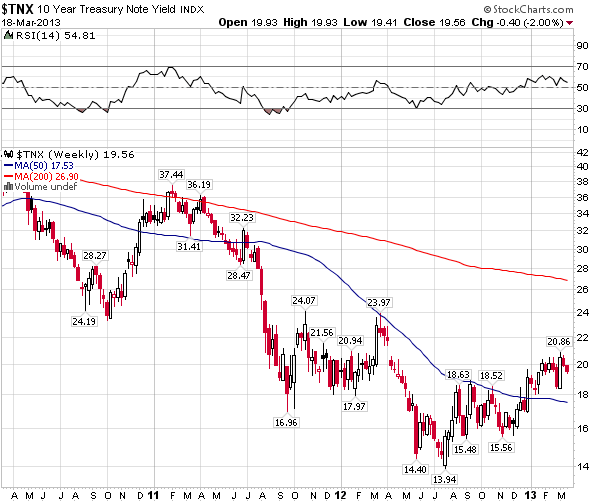 If global growth can persist a little longer, then more money should pour out of treasuries and into pro-risk. We need froth and excess and growthflation to end the cyclical bull if we are to align with history. Before reaching the cyclical bull top, a pullback in equities would be normal, followed by a higher high with divergences. Should such a pullback occur, we should see commodities becoming the target of the money flow and advancing despite equities. This is all as per history – anomalies can occur – but that is my primary scenario. Got internet this morning so time for a post. 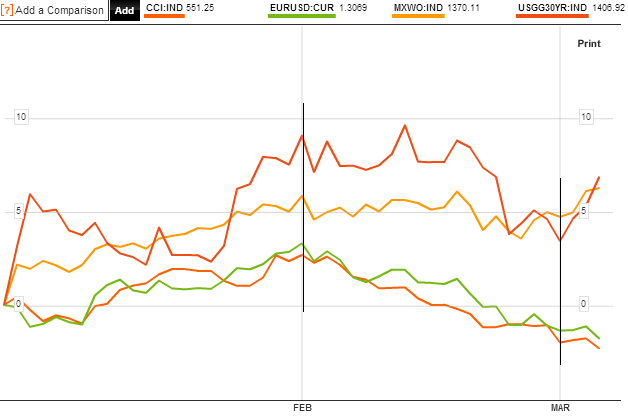 The chart below reveals that pro-risk (proxied by MSCI World Equities, Euro-USD, CCI equally weighted commodities index and 30 year treasury yields) made a correction throughout the month of March. Today Euro-USD and commodities have popped up – not captured yet in that chart – so I suggest the correction in pro-risk may now be over. Equities remain the leading class, and various indicies have broken out to new highs in the last two days, which cements the idea of the correction is done. If you recall the 5 models in alignment, they projected a January swing top and a March swing bottom. If this is playing out, then the next and final top should be around June. With history as our guide, the stocks cyclical bull should end with a frothy overthrow, so the kind of sentiment and buying levels we are reading about should be expected. However, I am not sure whether stocks can keep pushing on from here until June. I originally targeted around 1600 for the SP500 to top out, and this was echoed in work by Laslo Birinyi and Barry Bannister. We are currently less than 4% away from that. 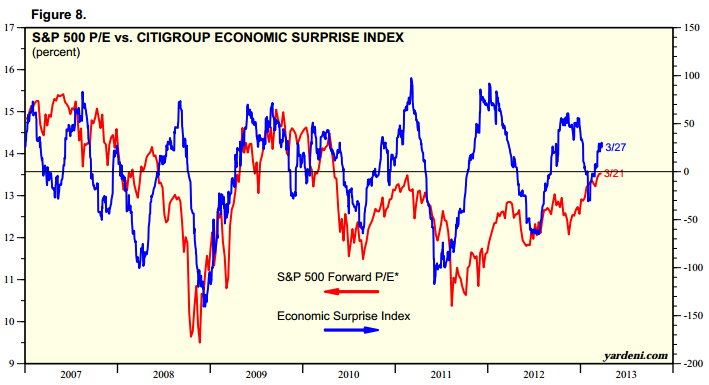 Citigroup economic surprises are back in the positive for the US. ECRI US leading indicators have weakend a little but remain in a strong positive uptrend. 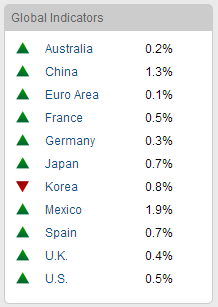 The last missing update in CB leading indicators was for Euroland which came in a positive and improved +1.0. So, right now, we have a backdrop for pro-risk to advance, but I am watching for evidence of trend changes in these indicators. I believe the Nikkei has entered a new secular bull, after a 19 year cycle from nominal top to nominal low, but that this steep single leg up needs to become a more stable ‘W’ with a retracement, a higher low and then a push on again. Commodities, as a whole, are in a different place, with sugar, coffee, precious metals, wheat, orange juice and others suffering bearish sentiment and low buying interest. However, most of those are now back to important support levels, which combined with the contrarian sentiment readings, provide a good base to rally. And so we return to the guide of solar/secular history, which suggests commodities should now take over as the outperforming class, and while equities process a top, commodities go make their secular finale. This, as you know, is subject to the solar peak timing being correct, and we still do not have decisive evidence on this, so I continue to watch sunspots. The consensus therefore remains that it should be taking place ahead this year – and so it remains that a daily sunspot count over 200 would help sure up that likelihood. Therefore, that scenario remains my favoured and I am positioned for it, but until the alternative secnario is weakened, I am not taking on further commodities positions, despite some very attractive current plays. TheDarkLord referred to the possibility of a twin peak, based on the similarity to solar cycle 14. I covered this last year, when the parallel was already being floated – see here. You can see in the charts on that link that SC14 was essentially a flat top as well as a twin peak, but note that the smoothed solar peak and the secular asset peak both occurred at the front peak – in fact they happened both dead on Feb 1906. So, it is the smoothed peak forecasts, as compiled above, that are key. That said, I have previously shown that there should be an echo commodities peak (a lower peak) a couple of years later, which could tie in with a second solar peak. However, I have also previously shown that by that point, being in equities is the place to be, returning better than commodities. 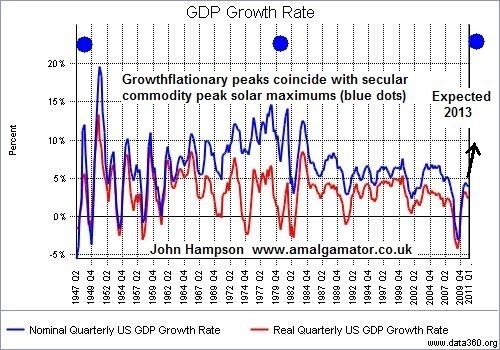 Therefore, it does not change my strategy: assuming the consensus solar peak is correct and ahead, commodities should make their secular peak in the months following it, then I wish to exit commodities and target equities. I have not been able to update the models this week, but will do so next week. The key points are that the new moon takes place on Monday, the geomagnetism model has weakened slightly (geomagnetism should start to seasonally worsen here) and sunspots are back up around the 100 zone.